promote positive social interaction regardless of who you are or where you come from. We are all people. initiative that brought happiness to young children abroad. small and we strongly support local blood drives. in the Florida Keys. CAOK is proud to support and participate in their rehabilitation efforts. alignment with our core values." The mission of our 501(c)3 nonprofit organization, is to empower and inspire people and their communities. Through Conscious Acts of Kindness®, we spotlight global issues, raise awareness, and unify the voices of our planet. 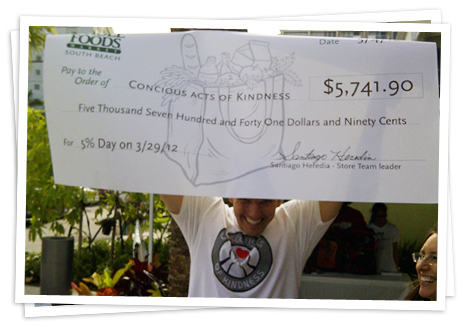 Conscious Acts of Kindness was founded in 2011 by Joaquin Ortiz. He wanted to establish a nonprofit foundation that focused on global issues and hosted events that raised awareness for the underprivileged and those in need. The Conscious Acts of Kindness movement started with small offerings such as bringing hardworking Miami Beach construction workers bottles of water and sports drinks; as well as paying for parking time at meters with handfuls of quarters. Slowly as the movement grew, Conscious Acts of Kindness teams were organized in several cities across the United States such as: Portland, Los Angeles, and New York. There was one simple mission everyone followed, perform a conscious act of kindness that makes the world a better place. As the idea of "conscious acts of kindness" began to develop, Joaquin noticed the contagious effect it had on those around him. He has since taken the appropriate steps to transform his idea of consciously helping others into a global nonprofit foundation. After becoming a 501(c)3 nonprofit foundation, Conscious Acts Of Kindness® were organized and coordinated both locally and abroad. Domestically, Conscious Acts of Kindness® has handed out 1,000 roses labeled "You Are Loved" to senior citizens for Valentine's Day, Surprised a 14-year-old boy fighting cancer with a limo ride and courtside seats to a Miami Heat Game, as well as having helped beached baby pilot whales at the Marine Mammal Conservatory. Overseas, CAOK events include: feeding an entire village in Bali Indonesia, giving out 500 kites to children in Pushkar India, and bringing a bounce house castle to children in Senegal West Africa. "A unique nonprofit dedicated to the beautifully simple premise of- well璽�玲在eing nice to people." family should be followed by all humans who would like to make a change in this world." Sign up to become a Key to Consciousness. Enter your information below to receive an invitation to our next event. Want to collaborate with us; are you traveling, do you advocate a great cause? We want to hear from you! Share your thoughts with us in the form below ... Who knows your idea could be our next Conscious Act Of Kindness!